3-8-19 All trails are open, groomed and in excellent condition! Snow and cold have allowed grooming to be very effective. More snow is in the forecast for this weekend, but mid-week appears to contain a peek at spring. 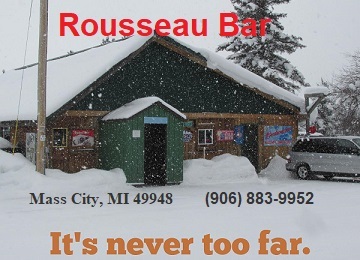 2-26-19 We haven’t felt the need to update, as there’s been plenty of snow, all grooming has been progressing as described in the earlier postings, and conditions have been, for the most part, very good to excellent. However………..our trails are now afflicted with TOO MUCH SNOW! The blizzard of this past weekend, following a 30+ inch Lake Effect Snow event a week earlier, deposited copious amounts of snow and remarkable winds, resulting in trails that were, and still are, drifted to the point of groomer impassability! We currently have one groomer stuck in a huge (not only high, but very long) drift on the Twin Lakes side of Donken. Sleds were not able to be on the trail here anyway, so this area is passable. We’ve also had groomers stuck in open areas in the Greenland and Mass City areas. So………please be aware that we’re doing the best we can and an update will follow notification that we’re back up and running. 2-4-19 All trails are open and being groomed per routine schedule. We received a few inches of snow yesterday -vs- the ice and sleet some got. More snow is on the way for later this week and weekend. Logging activities continue on Trail #3 (Bill Nichols Trail) a few miles north of the Firesteel trestle bridges. The trail is plowed, not groomed, and logging equipment may be present M-F during daylight hours. The beginning of the plowed area is clearly marked and very visible from both ends. Please use caution at all times in this area! 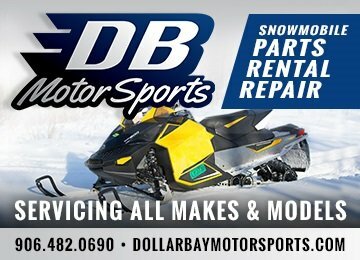 *****Just a reminder that Superior Snowmobile Club now has a website: WWW.SUPERIORSNOWMOBILECLUB.ORG. We hope you’ll check it out and pass on any suggestions! You can also send us an email at SUPERIORSNOWMOBILECLUB@GMAIL.COM. 1-25-19 As prior, all trails are being groomed per routine schedule. Quite a bit of new snow over the last few days, and more LES on the way! Attending that LES will be brutally cold temperatures. Add to that the wind chill factor, then add to that the wind chill factor you create while riding, and it’s dangerous out there without proper protection. Visibility will also be diminished from the snow in the air; falling from the sky, and also “snow dust” created by the sleds on the trails. The trails should set-up well after the groomer passes, so riding should be very good. Be sure to watch for logging operations that are ongoing on Trail 3S during daylight hours M-F (see below). 1-16-19 All trails are open and being groomed per routine schedule. The higher elevations typically have the most snow and hence better trail conditions, and there is no exception to that generality at this point. The LES machine is set to wind up as the colder air heads in our direction. Logging activities continue on trail 3S, beginning approximately 4 miles N of the 3 Firesteel trestle bridges. The area is well marked, but please use caution during daylight hours M-F.
1-9-19 All trails are open and being groomed per routine schedule. We received about a foot of light and fluffy LES (Lake Effect Snow) overnight, and it’s snowed all day today here in Twin Lakes. This is on top of trails that were in good condition. We’ve had over 110″ of snow so far this season; not remarkable for this area, but still adequate! There are a few logging operations still working. 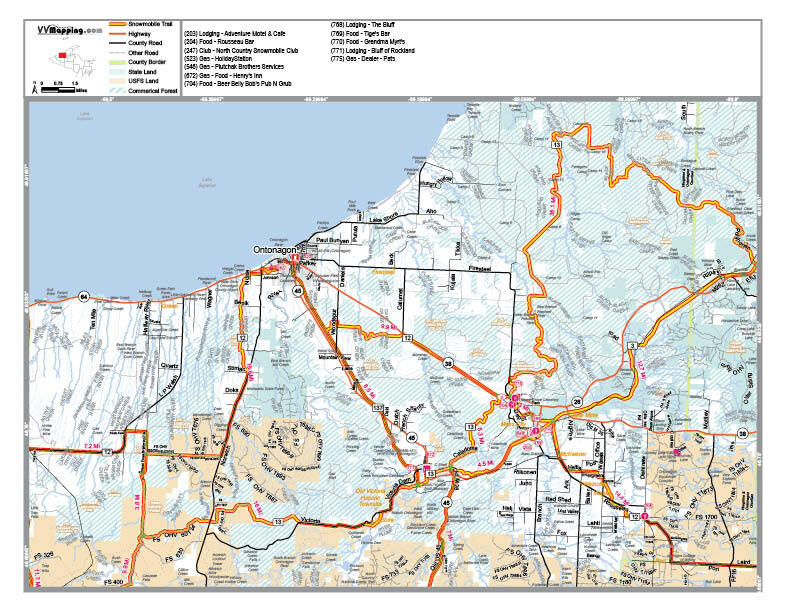 The Bill Nichols Trail (Trail #3) is affected south of Twin Lakes a few miles north of the Firesteel trestle bridges. The trail is being plowed by the logging operation, but is minimally affected for riding. However, please use caution M-F during daylight hours, and be safe out there! 12-6-18 FIRST UPDATE OF THE 2018 / 2019 SEASON! Early season riding conditions out there…………we’re packing down the new snow on parts of the main trails (especially Trail #3), but expect open water and mud in areas that still need time to freeze up. We had about 12″ of older snow in the higher terrain, and have gotten at least 8-10″ of new snow (Lake Effect Snow) yesterday and today. Be safe out there! 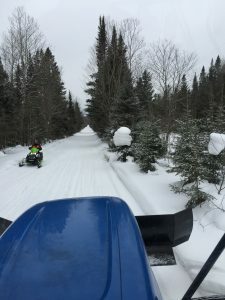 Just a reminder that Superior Snowmobile Club now has a website: WWW.SUPERIORSNOWMOBILECLUB.ORG. We hope you’ll check it out and pass on any suggestions! You can also send us an email at SUPERIORSNOWMOBILECLUB@GMAIL.COM. We’d sure like for you to join our club at $25. per year. You’d be surprised how that $25. helps out with our expenses for fuel, maintenance and costly repairs. Memberships can be obtained thru our new website (print the form from the link on the Home Page), Krupp’s Resort or Krupp’s Mini-Mart in Twin Lakes, and Pat’s Yamaha/Polaris in Greenland. 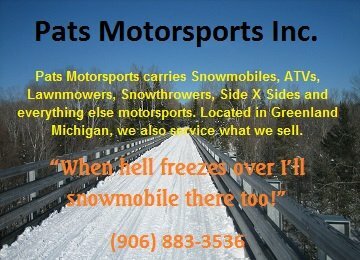 Also, if you care about snowmobiling in Michigan, please consider joining Michigan Snowmobile Association. This is the organization that speaks for our sport in Lansing and is also the organization that works for the clubs for the trails we are privileged to ride (both commercially owned and privately owned land). Please contact them through their website: www.msasnow.org. This is the website that you are reading, as I type.